Mary Wynne is certified by Dr.Hauschka Skin Care to offer the following internationally-recognized signature treatments. From head to toe, receive an enveloping, sensory-rich experience that is transformative to the skin and the body’s internal processes. Your treatment begins with deep relaxation: a warm sage foot bath, a moisturizing treatment for the feet and legs, and gentle stretching movements for the neck, arms and hands. Lavender aromatherapy compresses begin the cleansing process, followed by an herbal steam and Cleansing Clay Mask to prepare the skin for Lymph Stimulation. Soft brushes stimulate fluid flow in the connective tissue, giving a harmonizing and decongesting impulse to the skin. The treatment concludes with a nourishing mask and décolleté massage. The Classic Treatment results in a glowing complexion and a feeling of lightness and inner balance. Your individual skin condition is analyzed and addressed with specific product application. Relaxation begins with a warm, sage foot bath and moisturizing treatment for the legs, feet, arms and hands. The face is cleansed following warm, aromatherapy compresses. Gentle, rhythmical hand and brush strokes stimulate the movement of lymph. A nourishing mask, specific to your skin condition, and décolleté massage follow. Stress and tension melt away. You awaken to renewed energy. Purify your complexion with this deep cleansing treatment. First the warm, sage foot bath draws energy and stress away from the head. The skin is relaxed and prepared for cleansing with warm, aromatherapy compresses. An herbal steam bath softens pores, enabling the Cleansing Clay Mask to absorb excess oil. Gentle hand and brush strokes stimulate lymph movement, bringing a harmonizing, decongestive impulse to the skin. Your skin feels fresh, clean and renewed. This treatment begins to restore a healthy complexion. Aromatherapy compresses warm the skin before cleansing. An herbal steam bath softens and opens pores in preparation for the deep-cleansing clay mask, which absorbs excess oil. Blemishes and blackheads are visibly reduced. A rhythmic conditioner and appropriate day care complete this effective treatment. Your skin feels soothed and purified. Rejuvenation begins with a warm, sage foot bath. Aromatherapy compresses, an herbal steam bath and purifying clay mask encourage deep cleansing. Gentle lymph stimulation promotes a renewed sense of well being and a healthy, glowing complexion. A rhythmic conditioner, nourishing mask and soothing décolleté massage complete the treatment leaving you refreshed and revitalized. 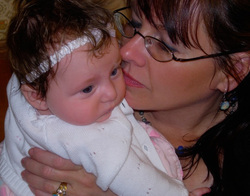 Pictured here is Mary Wynne with her granddaughter, Liliana, April 2008. "I can address all of your skin care needs regardless of age or condition." Schedule a private consulation and a facial and receive a skin care routine that addresses all of your needs for ageless, timeless beauty.